A Fire Fighting unit for Kilinochchi has been inaugurated by the Ministry of Resettlement. 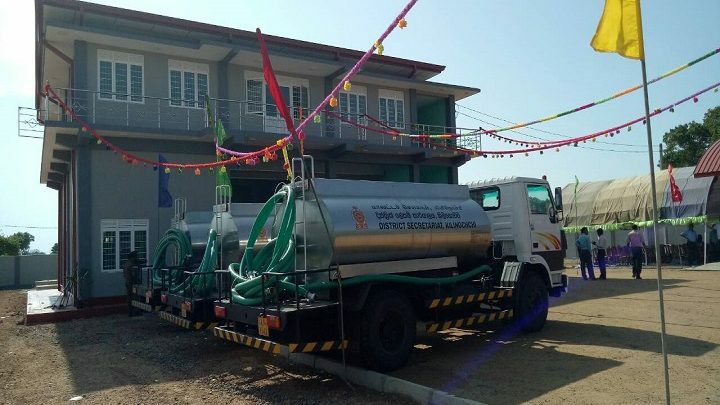 The District Office of the Fire Fighting Unit along with Fire Fighting vehicles was declared open yesterday near the Karadippokku junction and handed over to Karaichchi Pradeshiya Saba. Several shops in the Kilinochchi market burned down causing great financial losses. Following this debacle, several requests were made from several factions for a Fire Fighting unit for Kilinochhi Accordingly, this unit has been created through the Resettlement Misitry and handed over to the people. Several people participated in this event including Minister Swamynmathan, MP, S.Sritharan, GA.Suntharam Arumainayagam, Secretary to Ministry of Resettlement, Suresh, Members of the NPC, Kurukularajah, Pasupathypillai, Thavanathan, Chairman of Karaichchi PS and staff.